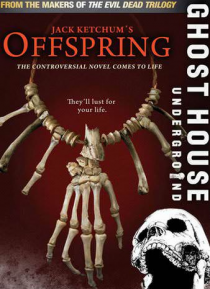 Based on the acclaimed novel and adapted for the screen by best selling author Jack Ketchum; OFFSPRING follows the survivors of a brutal flesh-eating clan that has re-surfaced in the once sleepy town of Dead River, Maine. The locals are in for a rude awakening when they realize it's the same pack that the sheriff thought he killed off a decade ago. Just when they thought the nightmare was over, th… ey're about to discover that the fight for their lives has only just begun.